Idéale saddles were a brand of leather saddles made by Tron et Berthet from Pont Saint Pierre, Eure Department, Haute-Normandie, France. Tron et Berthet sourced their leather from two suppliers in France, one in the north of the country and one in the south. The leather for the best saddles had to be a certain thickness, too thin and the saddle top would stretch and sag, too thick and the leather fibres would break as the top was formed causing failure of the saddle. Even when cutting up the hide, knowledge was needed as to which parts of the hide were to be used for the best saddles, the rest of the hide being used for children's saddles. Jean-François Tron had started his Idéale saddle production in the 1890s in Paris and moved to Pont Saint Pierre in 1900. Marcel Berthet married Jeanne Tron. Jean-François Tron died in 1931 and control of the company passed to Jeanne Berthet and her brother Jean Tron. Jean Tron remained with the company until the 1970s when his nephew Pierre Berthet became it's director. Pierre Berthet was the grandson of Jean-François Tron. Idéale had an association with the Dunlop Company of Fort Dunlop, Birmingham before the outbreak of the Second World War. Tron and Berthet had sourced some of their machinery from England, which would later cause problems, as it was calibrated in imperial dimensions (inches) and of course, France was metric, which required time consuming conversion. Changing patterns in agriculture after the Second World War were to have an impact on Idéale, as cattle breeds changed to facilitate greater food production. The newer breeds did not produce the type of leather Idéale required and made sourcing the required leather much more difficult and expensive for the company. The changing fashion, within cycling, from the 1960s onwards, for Italian plastic saddles like Unica-Nitor, would also have long term impact. As the fashion amongst cyclists changed from a purely leather saddle, in favour of leather covered padded saddles over a plastic base, (Cinelli, Concor, Milremo, Rolls) meant in reality, many cyclists were not prepared to invest time and discomfort in breaking in a leather saddle to achieve a comfortable seat. 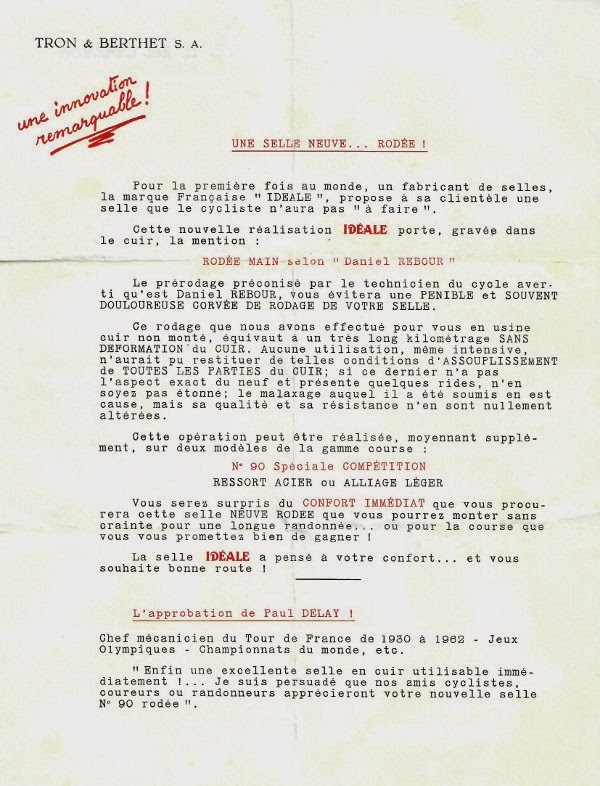 So Idéale's market share for bicycle saddles began to decline, as their top of the range saddles were leather, in addition to the other difficulties. Idéale also had VAR Tools produce a saddle adjustment spanner which would fit both Idéale and Brooks. Unlike the English made Brooks saddles, Idéale leather saddles were waterproof, so didn't absorb rain water and sag if they got wet. Idéale had developed their own secret process which allowed the leather to be waterproofed in the saddle manufacturing process. 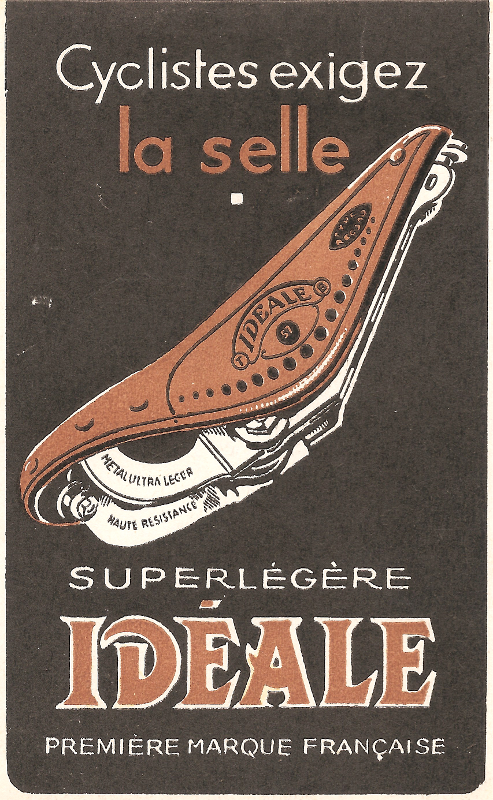 Idéale also experimented with different materials for their saddle frames. Initially they used steel, which on some models was chrome plated. Chrome plating became harder to have done towards the end of production, as changing health and safety regulations forced many platers to close. Tron et Berthet also experimented with alloy and produced saddles (Model 90R Competition) with an alloy frame. 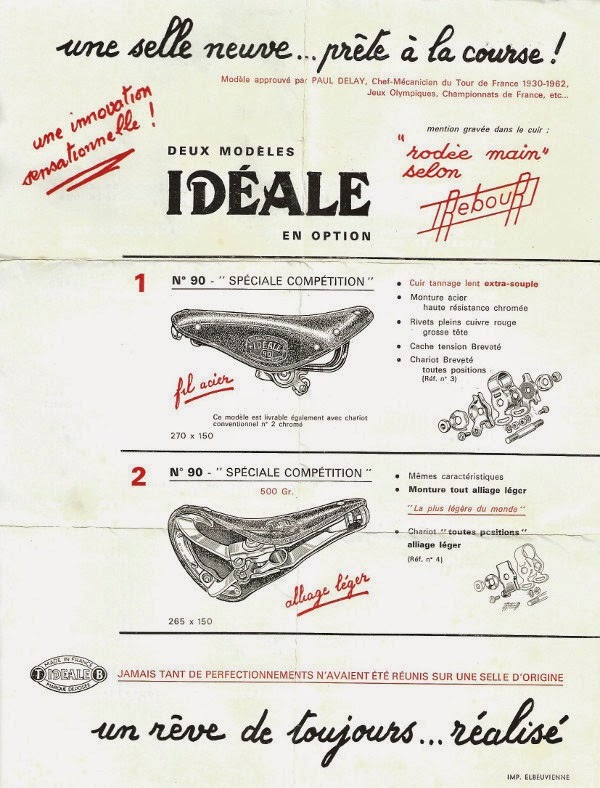 Towards the end of production in the 1970s Idéale made saddles with Titanium frames and seatposts. Special saddles were produced on occasion, an example of which I saw with the leather top drilled full of holes for lightness much like the fashion for drilled components used by time trialists in the 1970s. Idéale did produce a copy of the Brooks B17 saddle (Model 80 Record)) which sold well. They also developed the Daniel Rebour branded Model 92 'Diagonale' and Model 88 Competition. The Berthet family sold the business to another company which wanted to modernise the business and mass produce the leather saddles. In reality, the new owners had little appreciation that the leather had to be hand worked. Their attempts at mechanisation failed and the company went bust approximately six months after the new owners took over. A sad end for an iconic brand. Idéale saddles are well regarded by collectors and were the saddle of choice of many French 'constructeurs'. Idéale saddles in good condition are now beginning to command high prices on French ebay. 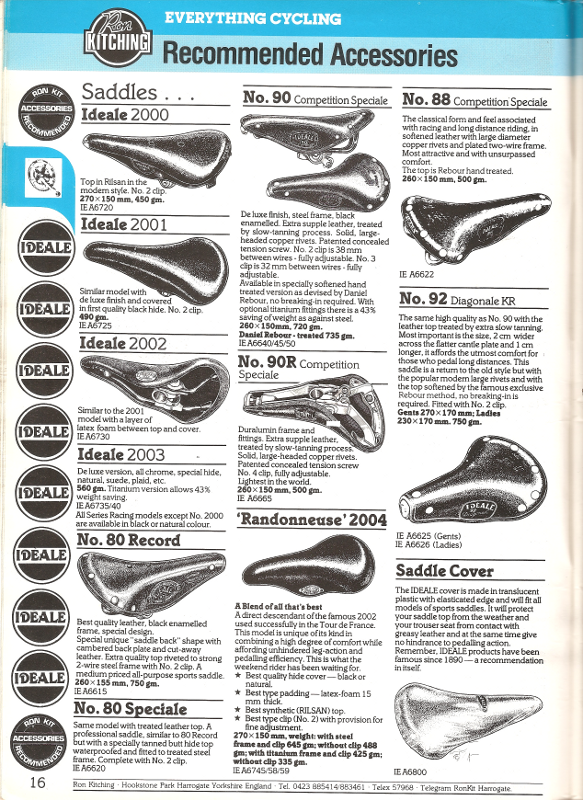 Idéale saddles was one of the lines that Ron Kitching imported and sold from his Harrogate cycle parts business. They were considered expensive by many in the 1970s and I don't have any recollection of any local clubmen from that time using an Idéale saddle in this part of Ireland. Thanks for the post. I really like your information that you share among us. We are really looking forward to your future post or work.It really a worth full post.